It may have taken 11 hours and two deals at the end to bring this year's GUKPT Luton Main Event to a close but when the confetti had finally finished falling it was Driton Haxhiaj standing victorious. After a relatively slow start late last week one of the GUKPT's top events gradually picked up some steam and by the time the registration desks had closed an impressive 262 entrance fees had been collected. That haul meant a top prize of more than £75,000 and as yesterday's final session got under way it looked as though Sin Melin would be taking home that prize. The Full Tilt ambassador started the day with a huge chip lead but as pressure of the spotlight shone down on her during the early stages she began to wilt. Indeed, as short stacks managed to defy the odds it took almost an hour before Ben Miller became the first elimination when his pocket tens were unable to overcome Driton's Ah 7d. Now down to 11 players the rail watched as Paul Alterman and Neil McCulloch followed Miller out of the tournament area leaving a final table of nine to battle for the top prize. At this point Melin had slipped from the top of the chip counts and by the time Mitch Johnson and Danny Toffel had fallen by the wayside she stood on the brink of elimination. Having endured a rough time since the start of play the popular pro finally committed her stack with Qc Jd but was unable beat luck or Iqbal Ahmed's Qd Ts. With the former chip leader out in 7th the focus soon shifted to Ahmed who now held a dominating position at the top of the leaderboard. Indeed, despite Driton and Caicai Huang dispatching a player each it was Ahmed who took control of a four-way deal. Thanks to a commanding lead the circuit grinder was able to guarantee himself £50,000 whilst the remaining three players each banked £35,000. That left £15,500 to play for but, as Dean Clay and Ahmed fell in fourth and third respectively, a second deal between Huang and Driton chopped that amount in half. With both players exhausted from the marathon session they each agreed to take home £42,750 before Driton clinched the title after Huang missed her open ended straight draw. 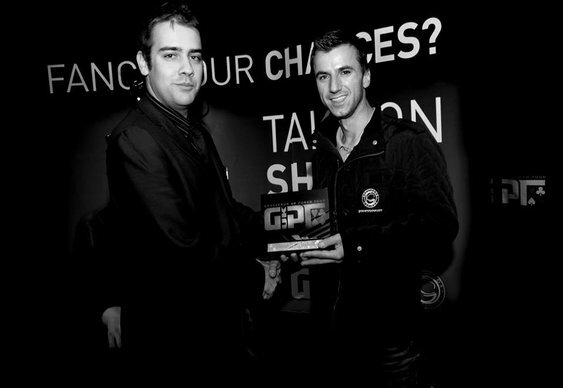 Image courtesy of the GUKPT blog. The GUKPT heads to the seaside next month with the Sandcastle Casino the venue for GUKPT Blackpool. Qualifiers for the £1,000+£70 Main Event are up and running at Grosvenor Poker.